This years’ Guardian Challenge was devised by Master John Russell and the Birmingham Black Sash Class. Taking part in the challenge will not only benefit your Kung Fu, you will also be raising money for charity by getting sponsorship. All money raised will go to the Lau Gar Trust Charity, which works to promote and improve the learning of Lau Gar. We think it is great fun and really challenging! Teach each exercise until you are satisfied that it is being performed correctly (see video clips below). Once students are familiar with the exercises set up four stations, using station description sheets. Divide your class into four groups. Each group starts at a different station. Each exercise takes one minute. You will need a timer set at one minute intervals. Many Apps are available or use a gong or whistle. Students perform each exercise for one minute and then move on to the next one. The fifth exercise is performed whilst travelling to the next station. If you get to the next station early take a rest and then begin on the next minute. If you are not there by the next minute stand up and run to the next station. It takes students 20 minutes to complete one circuit. The challenge is to complete three circuits without stopping during one session in the last week in June. In Birmingham we all found the exercises challenging at first. The idea is to complete each one at your own speed for one minute. The emphasis is on quality not quantity so don’t be tempted to rush. You will be building strength, endurance and improving balance. You will gain speed as your body adjusts to the training demands. If you need to rest do so in a recognisable posture, for example, hold horse stance, woo dip ma, plank or reverse plank (as appropriate). If a student cannot perform a particular exercise because of injury perhaps they could keep time or cheer others on, rather than risk further injury or performing the exercises incorrectly. Invite family, friends and sponsors to witness your achievement! Participants who collect more than £30 will get a free Tee shirt or you can purchase one for £15 (please indicate tee shirt sizes required). 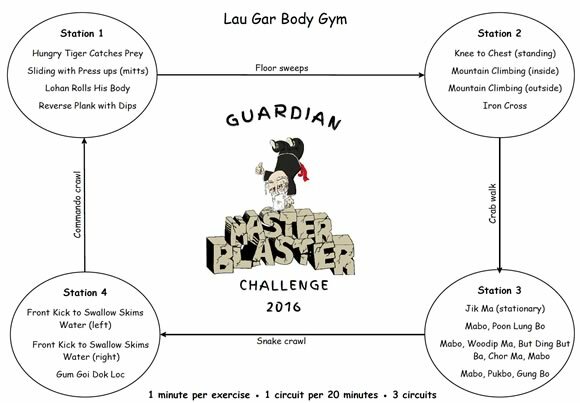 You can use the following download to promote the Guardian Challenge and to set up the stations on the day. Click here to download the Four Station exercises to print and use. The following four videos will help you understand how each of the exercises are to be performed. Each video corresponds to each Station around the Challenge.